on verso signed, titled, dated August 1969 and inscribed "Acrylic Polymer W.B." At first glance, you see what might be a Guido Molinari. Or is it a Kenneth Noland? A Frank Stella? As you look closer, small details emerge that trouble these possible identifications: the unusual deployment of colour; the fact that the red and peach bands tilt up towards the right, somewhat rakishly; the uneven edges between various colour bands. You cannot put your finger on why, but the work feels like a Jack Bush. Of course this is a Bush - only Bush would utilize the stylistic elements of late-1960s abstraction just to cheekily undermine them. 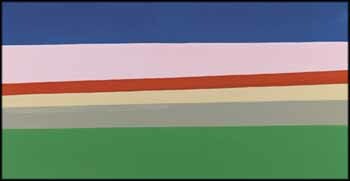 In 1966 Bush began using masking tape to delineate colour fields. Unlike other artists who strove for perfectly clean edges, Bush let the bits of paint that had leaked beneath the tape remain. This was an extension of Bush’s paint handling technique: works featured splotches, drips, rubbed-in colour, and patches that suggest overpainting or editing. Rather than erasing these traces of his presence, he allows them to stand as testament to the process of painting. In this work, the bits that bleed between grey and peach, or the places where red and pink intermingle, serve to add textural interest to the work - a surface texture that Bush would later embrace in his mottled-ground works. Bush returned to the striped column in his Fringe works of 1968, though the colour columns in these works are often narrower, occupying less of the picture plane than in 1965 and 1966 (such as This Time Yellow from 1968, in the collection of the Art Gallery of Ontario). These fringes began to expand and mutate slightly in March/April of 1969, when Bush developed angina and translated his chest pains into the gouache series Spasm. These works featured dart-like “heart throb” shapes hurtling towards planes of stacked, intense colour. In his Spasm series, Bush utilizes this established vocabulary of stripes to paint a deeply personal experience - one in which tragedy is transmuted into vivid, almost triumphant, colour. The series is at odds with the ostensibly non-referential nature of Colour Field works. In some ways, this represents a perfect Bush moment: expectations of Colour Field disinterestedness are subverted, and instead, lived reality is celebrated through riotous colour. This invocation of both his own history and that of other Colour Field painters is perhaps why Fenton wrote, in the same article, that he could “think of no other artist who so consistently confounds one’s initial expectations.” Rather than a cool, detached work that only references its own materials, this painting is brimming with Bush’s life, in all its idiosyncratic beauty. Rather than an impersonal, formulaic painting system, we are greeted with a deeply personal and intuitive understanding of how and why colours fit together, and of the ways in which textures can increase the viewer’s experience. Fenton ultimately states, two months before this painting was produced, that “what a painting looks like initially and what it proves itself to be is a continuing critical problem posed by Bush’s art.” This problem is not overt; it necessitates careful scrutiny. In this, as with all Bush works, the reward is there, if only you look for it.